an attractive, durable, easily assembled 8' x 8' sukkah (shown above) or 8' x 16' double sukkah! Notice! A couple of errors were found in the assembly instructions! My apologies for any grief this may have caused! Please see pages 3, 5, 6, 8, and 10 in the FABRICATION OF COMPONENTS document. All you need is a circular saw, a drill, and a few hand tools. 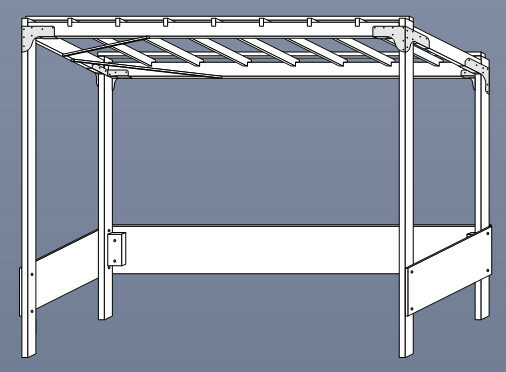 Download and print the detailed instructions, purchase the materials from your local hardware or home improvement store, and a spend few hours one time to fabricate the sukkah components. Then, year after year, you will assemble and disassemble your sukkah in minutes! I've included three slide shows to demonstrate the step by step operations of fabricating the components and assembling the sukkah. If you have any problems, comments, questions, etc. email me at sukkah@telarian.com. I'll answer as quickly as I can.